LHAND Since 1948 the Lynn Housing Authority & Neighborhood Development (LHAND) has had a mission of assisting low and moderate-income families and individuals with safe,and affordable housing. Lynn EDIC The Economic Development & Industrial Corporation of Lynn (EDIC/Lynn) is a non-profit corporation established under a state mandate in 1977 that functions as the City of Lynn's development bank. City of Lynn Assessor Maps: Our City maps are available in PDF format. You may access a specific section of the city by clicking on the corresponding map rectangle in the index. The first three digit segment of the Parcel ID corresponds to the appropriate map. The Lynn Memorial City Hall and Memorial Auditorium are listed with the National Register of Historic Places through the United States Department of the Interior. 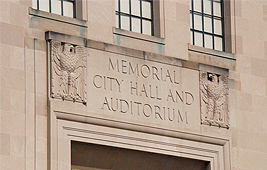 Constructed in 1948-1949, Lynn Memorial City Hall and Auditorium is a late example of an Art Deco-style civic building that also reflects the influence of the contemporaneous Modern Movement in architecture. Monumental in scale, the building is the focal point of City Hall Square. Recent news and media articles. Community Development Director, Jamie Marsh was recently interviewed by LynnCam TV and discussed a variety of projects and activities taking place in the City of Lynn.